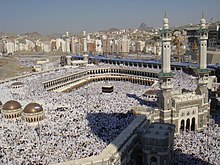 ↑ "ihram". ihram. 2014. http://www.britannica.com/EBchecked/topic/282481/ihram. Retrieved on 6 ਅਕਤੂਬਰ 2014. ↑ Karen Armstrong (2002). Islam: A Short History. Modern Library Chronicles (Revised Updated ed.). Modern Library. pp. 10–12. ISBN 0-8129-6618-X. ↑ Anisa Mehdi; John Bredar (2003). "Inside Makkah" (video documentary)|format= requires |url= (help). National Geographic Society.